This is a ballad by late Konkani poet, Dr Manoharrai Sardessai, also well versed in Marathi, Hindi, English and Portuguese. 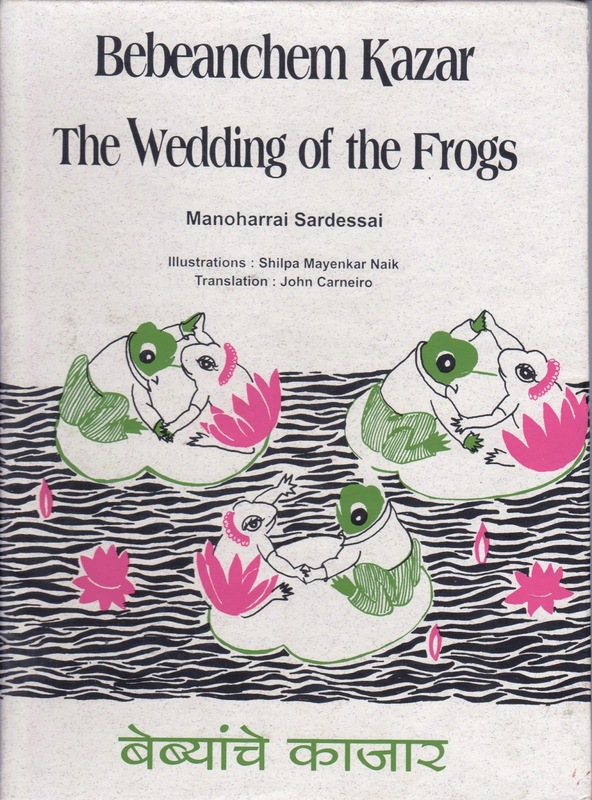 The poem opens with five frogs, brothers in the lotus pond at Paliem. Skilled, intelligent and everything nice, they had a good life and knew it. Everytime someone suggested it was time they get married they'd dismiss the suggestion. Why should they? They wanted to come home from the bar slightly tipsy and not have a wife take them to task, they didn't want to spend all their savings on setting up a home. But youth for all it's wit is still no match for age, and a wily old frog sends his beautiful daughters out to the pond to splash around and charm the brothers into changing their minds. Before you know it, the five brothers are head over heels in love and asking for the old frog's permission to court his daughters and walk them down the aisle. It's interesting to see how our ideas of children's literature have changed over the years. Here's a ballad aimed at rather young children, talking about the male frogs wanting to come home tipsy and not spend their earnings on the upkeep of a home, you have seduction strategy with female frogs coming out to play and entice the male frogs while they 'wiggle and sway, swim and dive most gracefully.' But then most children's fiction and writing of a certain time talks of marriage, death, murder. Far more adult compared to contemporary children's writing that mostly focuses on children of their own age and their specific issues, like ragging, dealing with the loss of a friend, and mostly rather innocuous topics. The Brat and Bean enjoyed this story, particularly because they've asked their father time and time again to tell them a Konkani story from his childhood and he's come up blank. John Carneiro's translation seems competent and as good as one can possibly get, while trying to maintain some form of rhyme. The entire poem is given in Devnagri script at the end of the book (Konkani is written in Devnagri script) and that makes it easy to read and achieve a certain rhythm, once you've figured out the meaning. The hard cover book itself takes on the role of an almost heirloom thanks to the fabulous artisan's paper it is screen printed on. 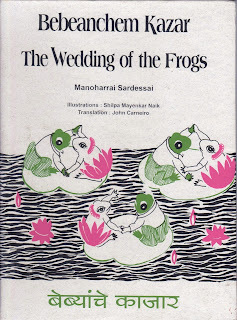 Goan artist Shilpa Mayenkar Naik's lovely illustrations are in shades of black, pink and green - an interesting choice. A great book if you're interested in exposing kids to a variety of cultures at a deeper level. Ribbit, ribbit, we're off to read it again. Unusual pick Smrits. Would love to check it out.